It was good to buy it because it is durable and easy to finish. This review is about item#6713193. It will be true for the first time after a certain number of years, but it is satisfactory at the time of installation work. This review is about item#6713184. I am firm as a rope that supports the net, and I think that I can also trust the tied feel. Handmade playground equipment, swings etc. Thickness, texture is just right. It is good to be able to be delivered immediately for free. This review is about item#22857293. I cut it to about 20 meters and use it, but 1. Loose twist 2. I am concerned about fraying of the fiber thread. 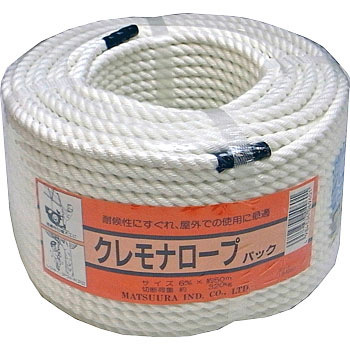 Used as guiding rope for hanging curtains and banners used during sale. Sturdy and reasonable at reasonable price. Cutting place is beautiful when wrapped with white vinyl tape. This review is about item#06713193. There are few Cremona ropes, there are few that have both length and thickness appropriate. This product is well-balanced in length and thickness, and cheap. I plan to purchase it in the future. This review is about item#06713202.